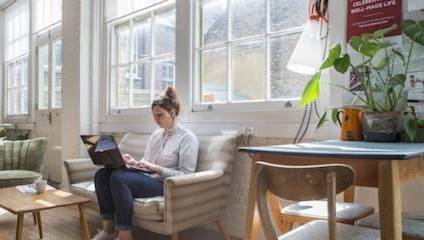 There are lots of benefits to freelance and flexible working, but there are definitely downsides to it too; you might get a bit stir crazy sitting in the same space all the time, or just feel a bit lonely. If you are a designer or artist, you might also need access to expensive tools or equipment you can’t have at home. There are quite a few options available to someone looking for other kinds of workspaces in London these days, but here are just a few. Working in a café can seem like an excellent idea, and can definitely increase productivity, not least because you can order coffee throughout the day. However, there is always the uncomfortable feeling that you are overstaying your welcome. A few cafes are now offering dedicated workspaces that you can rent on a month-by-month basis. The Worker’s Café in Dalston offers various subscriptions, from full time access to part time and daily rates, and gives you a 20% discount on food. Caya café on Coldharbour Lane also offers extremely reasonably priced monthly rates, with unlimited tea and coffee to keep you going all day. There are more dedicated shared workspaces across London, where you can join a community of other people in your field in specific office spaces for freelancers. Prices are higher than coffee shop membership, but they often offer 24-hour access, wi-fi and high quality facilities. Winkley Studios is a quiet and stylish shared office space in Bethnal Green. They have 16 desks available in an open plan room, meaning you can feel free to take up all the space you need for your work. With fast internet access and free coffee, this peaceful workspace is a great coffee shop alternative. If you are an artist, a maker or a designer, you might also need access to more specialised machinery and equipment. Makerversity is situated in the basement of Somerset House just on the embankment. They offer access to a huge amount of facilities including a textile workshop, a photography studio, digital and manual workshops, sound studio and assembly space. This is a more specialist space for people who are inventors and entrepreneurs, wanting to dedicate time to developing their ideas and businesses. There are several amazing shared spaces that are also run by members and offer much cheaper monthly subscriptions. London Hackspace is a so-called ‘hackerspace’, which essentially means a community-led shared workspace. Based in Mile End, this not-for-profit offers extremely cheap subscription services for unemployed people or students, as well as workshops on everything from metalwork to biohacking. They also have an amazingly detailed wikispace giving you tonnes of information on the local area, including food and pub recommendations. Remakery offer subscribers hourly rates a month, meaning you decide how much to pay based on exactly how often you’ll need the space. They have a special emphasis on reusing and recycling, meaning that this is a particular good space for someone interested in ethical making. South London Makerspace in Herne Hill is also a not-for-profit, with an accessible workspace and affordable subscription. Once you become a member, you can attend meet-ups and socials, as well as being able to use their various workshops. Though working freelance or at various jobs can often be difficult in London, these spaces allow you to reach out to other people either interested in the same things as you, or who also understand the pressures of working in the same way.